Doug Eiche describes his honey as “Distinct & Different”. To achieve this distinction, he carefully locates his hives where his bees can work among wildflowers & specially planted trees. Doug looks for trees that are appealing, diverse & as free of chemical pollutants. 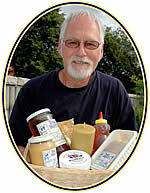 Doug has been a beekeeper since 1981. He has a Masters degree in botany, and is passionate about the health-giving properties of honey & the wide array of products that honeybees provide. On average Canada exports approximately 50% of production each year. There are an estimated 10,500 beekeepers operating more than 563,000 hives in Canada. The US is the primary destination for Canadian honey exports. Doug loves to share educational information on his bees, and the products that he sells at the Kerr Village Farmer’s Market.